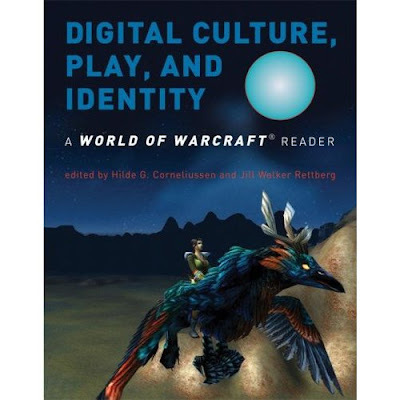 I wondered where I was when I got my copy of our lovely WoW book, Digital Culture, Play, and Identity: A World of Warcraft® Reader, since I didn't blog it. then I remember - I was travelling, Umeå, Volda, Copenhagen, New York, and too much was lost in transit. No not physically, but things to which I should have paid attention. The book is a wonderful object to hold, both because it's packed with work from people I know and respect, and because it know so much about the rest of it. I was there in that taxi in Copenhagen when we came up with the idea of the book. I read the early drafts of applications and suggestions that Jill and Hilde sent off, I was there while we discussed it in the different lists, in game, out of the game and when the call for paper went out to more than the guild I felt still involved in the process. Not to take the glory from Jill and Hilde, they did an incredible job in getting the book out, but I feel like this is my baby too. And the baby of Lisbeth, Charlotte and the other authors as well as the ones who were somehow inside the process but never got to present their work here. This is a book that comes from a game researcher's community, not a collection of strangers who happened to write something relevant, and so it carries with it an odd flavour of nostalgia. 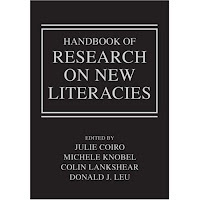 Another anthology I was represented in this year is written by exactly such a collection of (to me) strangers: Handbook of Research on New Literacies. This is a very different beast. It's a huge brick of work which can easily compete with Lord of the Rings in size, and it sprawls all over the place. I did find the articles of some friends here too though, and it looks like it has the potential of being a very useful reference work for the topics in new media research in this decade. I do have some fondness for it. Not because the articles make me remember great conversations and happy moments, frankly, I have not been able to take in all it contains, but because this book too has led me to meet great people. Interesting, sharing and generous people - in a way those people are more important to me than the stack of books and journals that is accumulating on my CV. I like doing this work. I just need to see a physical result once in a while to remember why. I am playing around with a couple of things now. First, I decided to try twitter, and made a profile there. I have to admit I fail to see the intense popular demand for details about what happens RIGHT NOW in my life. OK, I am occasionally an attention whore, but really - one thing is posting a good recipe and some angsty confessions here and there, but a minute-for-minute update on them is a little too far even for me. What I do think is fun though, is reading about other people's experiences in different types of projects, such as work at or around conferences, a quest to reach a deadline, experiments with food, more general topics which is about something slightly beyond their immediate self. Subjective, but a subjective I can relate to without feeling we should be in a committed relationship. Hence, I have for the time being decided to devote my twittering not to what happens here (it's same old same old anyway: I get up in the morning, eat, go to work, work, occasionally remember lunch, shop, make dinner, go for a walk or do some pilates, read, play games, call the family, fiddle with pictures on flickr or just on the computer, go to bed, rinse and repeat) but to what happens in Hyboria. So far I have been treated to a solid dose of genderconscious outrage, only tempered by extreme annoyance with the game performance. I am only at level 5 though - I know from WoW that I didn't really start liking it until around level 30. And I didn't understand anything about what was going on until level 50. Yeah, I am a little slow. Anyway: I have put in a sidebar here, a little widget, that posts my twittering. I am by the way quite happy with the options of Blogger, now that I have finally gotten around to using them. Once over the hurdle of updating and moving my links from the old template to the new, I have become a fan of the options in the new template. I may get a little over enthusiastic for a while, but bear with me. Want to understand games, but can't get to the lecture? Well, go play this educational game about games! I have to admit I haven't gone through the whole thing, after a while they wanted me to actually INTERACT and that got too exhausting. But it's a fun idea, and should be interesting for academic gamers. The game is a thesis developed in Potsdam, Germany, copyright is 2006-2007, so most likely submitted in 2007. Understanding Games is a diploma thesis project designed and developed by Andreas Zecher at the University of Applied Sciences in Potsdam, Germany. The project was advised by Prof. Boris Müller, Prof. Klaus Dufke and Mattias Ljungström. The game has been around for a while, and if you want to read more about the responses to it, Cory Doctorow has a pretty good description in Boing Boing. For those of you who read Norwegian, forskning.no had an interview with a bunch of game researchers in relation to the book we all wrote in, recently published from MIT Press. A nice resource for games and gender has been put together at "Investigaming". It holds links and references to a lot of articles on games and gender, and is an invaluable resource to help old, failing game scholars such as myself. If you're one too, there's help to be had! Some numbers - any good? At random intervals I sit down and look around for good sources of numbers of players for digital games. They are hard to find, but ESA have some numbers which give a hint at a direction as long as we remember that their main interest is to promote the video game business. Heads of Households – Sixty-seven percent of heads of households play computer and video games. Women – Forty percent of all players are women and women over 18 years of age are one of the industry's fastest growing demographics. Today, adult women represent a greater portion of the game-playing population (33 percent) than boys age 17 or younger (18 percent). Seniors – Twenty-six percent of game players are over the age of 50, an increase from nine percent in 1999. This figure is sure to rise in coming years with nursing homes and senior centers across the nation now incorporating video games into their activities. Parents – More than a third (35 percent) of parents play computer and video games and 93 percent of these parents have children who also play them. Sixty-three percent of parents with children under the age of 18 consider computer and video games a positive addition to their children's lives. Of course, as Luca points out, women 18 and up is a much larger group in general than boys 4-17. This means it should be no surprise that there are more adult women playing video games than there are young boys. It still marks a change though, as the market was, only a few years ago, dominated by young males. Are you a researcher and planning to play Age of Conan? There are a few of us who are planning to look in on that game over the summer. For Norwegians it's almost obligatory, after all. Nobody have made any decisions yet about server, method of organisation or anything else, but it can be a good idea to know some other n00bs when we start playing. Friends are the best buff, after all. So, if you do game research and plan to play AoC on a European server, feel free to get in touch and I'll see about spreading the word once we have our games. A new MMORPG reported. Careful though, it's expensive and very addicting, and has the potential of seriously disrupting your relationships and upsetting your entire friends list. Too cool for my shopping bags! After a lecture in Copenhagen, a long and exhausting trip to NY, an online conference in the US WoW, several slightly delayed reviews which are now done only a little late and a long student paper by a luckily very thorough student (luckily because thorough means lots of reading, but it is worth it) I came to a grinding halt yesterday. So time to go do something wonderfully decadent, and I did it in one of my favourite places for decadence, a tex-mex restaurant right at the Hudson River. It's a unique location for a New York restaurant, it has large and comfortable outdoor seating, very little traffic noise, a view of the water and a large part of the outdoor tables set under a little grove of trees, offering shade in the summer, the water supplying a cooling breeze. Right in front is the Hudson River Sailing School harbour, so sitting there, nursing your tequila of choice, you get to watch the boats and oogle the beautiful people walking, running and scating by on their way down Battery Park - one of the prettiest and best maintained parks in New York. 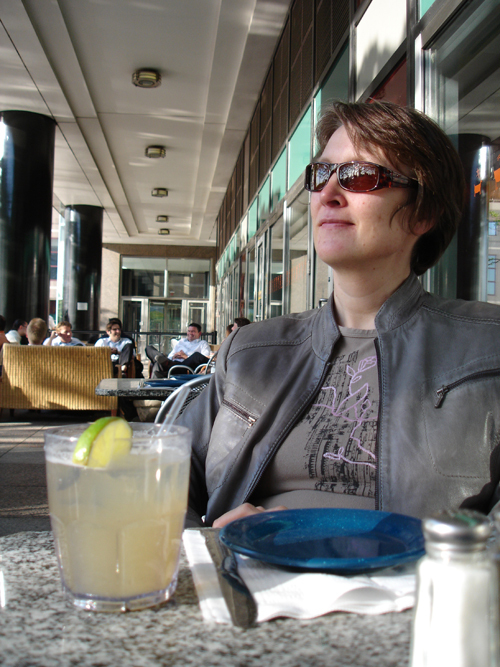 So, that's me up there, enjoying all these things and a drink, too. Life can be pretty good! Oh yeah, the shopping bags! Well, new shower curtains and a cheap coup at J&R don't go with all the über coolness, so they had to be hidden well away for the picture! Sometimes I have to go take a look in the mirror to see if I am still there. Then I have to go to the bookshelf to see if the books of my friends and wonderful co-game researchers are there too. Check if the Ph D's people were working on are finished. See if the conferences are still being organised. Just generally have a look around and check if my reality is still there. Today was such a moment. According to Roger Travis a huge and important chunk of game studies does not exist. Or worse - we are some struggling souls fighting under the tyrrany of such evil gamer-hating monsters as Aarseth, Juul and Murray. On my way around, checking, I am reassured of a few facts. I have studied gamers and gamers culture since the last milennium, long before gamestudies.org was established, before Espen published Cybertext, sufficiently early that finding Hamlet on the Holodeck was a relief, although I didn't agree with all in it. Two of the gamers I interviewed and was in contact with in that first major interview round have since had a chance to take their own Ph D's on games, one working as a researcher with a major game design company, the other as a designer and researcher on educational games. I have since argued for the gamers, against the formation of an exclusive discipline and in general for an increased respect for the intelligence of the users constantly for years. Not that I think my voice is that important, but, you know, I have not been doing it alone. I have had company in this argument since day one. But I guess that's not good enough - you see, the people I am referring too publish in journals, talk in conferences and write books, and are very rarely to be seen in American news media. And that is, obviously, where a game scholar should be represented for somebody studying games to read their work. Oh well. To be honest, I am in this not for the fame, but for the pleasure of pursuing good questions and sharing what I learn. Which I have been doing for a while now, with the generous and continous assistance of the gamers I study among. And, on the topic of geekiness: Text based first person shooter! I guess it was inevitable. "Stuff White People Like" was a great and extremely funny blog when I found it the first time. Since then it's become selfabsorbed and self-promotory - typical white blog reactions to success I guess. And now it turns into a book. The blog and the author was interviewed on Racialicious, and he appears very likeable, and yes, he agrees, the blog pokes fun of himself more than of anybody else. But the whitest thing of all is to laugh at yourself and your friends, relatives and neighbours in public and get paid handsomely for it - or at least get published. 1. Given that computer technology and Internet have stabilized, are current virtual worlds a technological dead end? 2. Other than WoW's are there really any long-term viable business models for virtual worlds? 3. Would standardization of software-data platforms be revolutionary, permitting migration across many worlds? 4. Could virtual worlds become living memorials for deceased persons, housing AI avatars of them? 5. Will virtual worlds create social and cultural alternatives that then thrive in the "real world?" 6. Which online games will become permanent features of human culture, like chess and Monopoly? 7. Will some virtual worlds declare political independence, like geographically based nations? 8. What as-yet unrecognized social functions could virtual worlds serve? 9. Could augmented reality (e.g. pervasive LARPs) be the next revolution, virtual and real world combined? 10. What will persist into the future from today's virtual worlds? Will they have a history? The responses were, as I could have predicted without a crystal ball, all over the place. If not at least 20 guesses were right, I'll be very disappointed. But that's how a decent sooth-sayer works - make so many guesses there has to be a hit, then say: "That's exactly what I said!" Personally, I just kept quiet, so all I can say in 10-15 years is: "Didn't I hear about this before?" Well, I have to admit, The Truants never had 100 people online for a guild meeting, but Science has it, for the Convergence of the Virtual and the Real conference. I am struggling to stay unlagged from the jet lag, reading a hyperspammed guild chat, and keeping myself from getting too sarcastic about cliche questions. The panelists are struggling heroically to deliver good and thoughtful responses though, and the audience is incredibly well-behaved. So, is it a good forum for a conference? Not really, typing is too slow and topics are zooming past like arrows from a well-geared hunter. Is it a fun event that people will notice, remember, refer to and talk about? Absolutely. In a few years it's going to be one of those "remember when we tried that..." things, as we giggle and ease ourselves into the professionally developed seemless virtual conference software. For four hundred years "The King's City" for Norwegians wasn't Oslo, but Copenhagen. This is where Norwegians went for education, for a chance to gain a public service position, to practice the arts and develop as craftsmen and artists, this is where licences were written out - for Norwegian newspapers and just about everything else. This is also where the decision was made to sell off significant pieces of Norwegian land, to persecute Norwegian witches (the last one was burned in 1695, and most of the Norwegian witches were among the sami - here a lot of men were burned as witches as well), and to drag Norway into the war that got us handed over to the Swedes. Still, with all it's conflicting history in the interwoven past of the Scandinavian countries, Copenhagen is my favourite Scandinavian city. I love the busy streets, a mixture of new, old and in-between, the bicycle lanes with their little special lights for bicyclists and the many, many different bikes. The Copenhagen idea of a family car seems to be a transport bike - a bike with a solid load space in front, frequently loaded with a woman and/or a kid, propelled by a grinning man taking his family to scool and work and getting a good workout too. I love the stores, as big and fancy as in much larger cities, and stuffed with Danish designer goodies: Clothing made for Scandinavian sized women and northern climate and northern tastes. And now I am stuck in the hotel room, telling myself I have to finish preparing for tomorrow, when what I want to do is to go out into the warm sunny day, find a cool soda and a spot in a park and watch Copenhagen bike past me. This had better get good! Some years ago I read an article discussing the real values in modern society. Property and objects were losing their meaning, security, time and space were becoming the only real values. This was such an interesting thought that I have been thinking about it ever since, when faced with displays of status-carrying objects, as it indicates that the concept of value is shifting. For a researcher playing around with non-physical objects and digital spaces, this idea of shifting values is interesting and captivating.